What do you put on your website and where do you put it? How are people viewing your business? Your entire e-commerce company can give you the answer to that one. People in your own company can tell you what customers want to know about your product and your services. You may be surprised with their answers, but always remember: how you see your product/service may be different to how your market sees them. 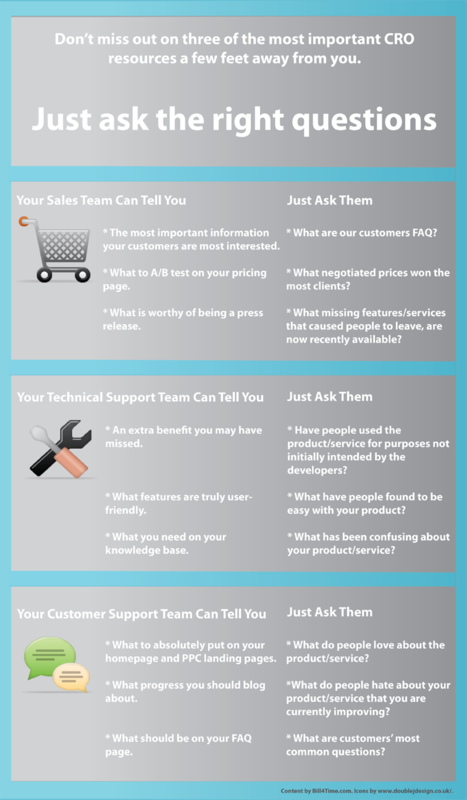 What are the top sales questions people ask? Answers to these questions need to be on your homepage or the second tier of pages easily found from the homepage. Be proactive in speaking to your market. Beat them to the punch. What are the barriers to entry? Why are people not converting? Is it price? If you find that there is a significant amount of people who are not converting because of the price, try doing some A/B testing on your pricing page. You may be surprised with the results. Another way to determine the right price is to have a sale and track the responses. Is it something that they don’t know about? Has your sales team often come across a shopper who initially didn’t want to convert because of a feature they overlooked? That feature needs to be in a clearer place on your website. If it’s already prominent enough, it probably needs its own page. Is there something that you can fix? You can tell a “want” from a “need” when they put their money where their mouth is. A desired feature is something that will not ultimately be a barrier to entry. However, they’ll tell you their deal-breakers. If your developers are currently working on this, make sure you have regular updates on its progress in your blogs. Once it’s released, it’s material for a press release! Add it to your homepage in a prominent place. Schedule an appointment with the sales team. Meet with the Sales Manager but also include the people who talk directly to customers on a daily basis. Listen to what they have to say but also what sparked the most dialogue. That will give you an indication of its significance. How are people using your product or service? Is it exactly how the developers intended the product/service to be used? If not, this is another angle to present it. If enough people use it for this alternative purpose, maybe this is something you should add to your main features page. What do people find easy and difficult about your product or service? Make the easy things a selling point on your website. With the difficult things, use your website to bring them over to the “easy to use” side by providing easy-to-access supplemental information on your website. Use articles, downloadable PDF documents, video tutorials, and webinars. Find out if there is already an FAQ file available with the technical support team. This could save a lot of time in content creation. Schedule a meeting with them to get more information. What are the things that people absolutely love about your product or service? These should be on your homepage and PPC landing pages. These points show you how your market views the strengths of your product/service. These are the gold nuggets that can win you more customers. What are the things that people hate about your product or service? Don’t have this on your homepage or at least, have it less prominent. As you progress in improvement, keep a blog letting your customers know that you respond to their needs. What are the most common questions? Beat them to the punch and include a FAQ page on your site. Get the top three and have it on the homepage or the second tier to make the FAQ page easy to access. Valuable information is close by. You don’t need to outsource to get it. You don’t need any high-tech apps. Get it in-house by tapping into the Sales, Technical Support, and Customer Support departments. All you need is a pad of paper and a listening ear. Jessica Eballar is an Internet Marketer. She has been a traditional marketer since 2006 and learned the ways of online marketing since 2008. She’s currently with Bill4Time, an online time tracking software that keeps track of time, expenses, and invoices for businesses throughout the world.